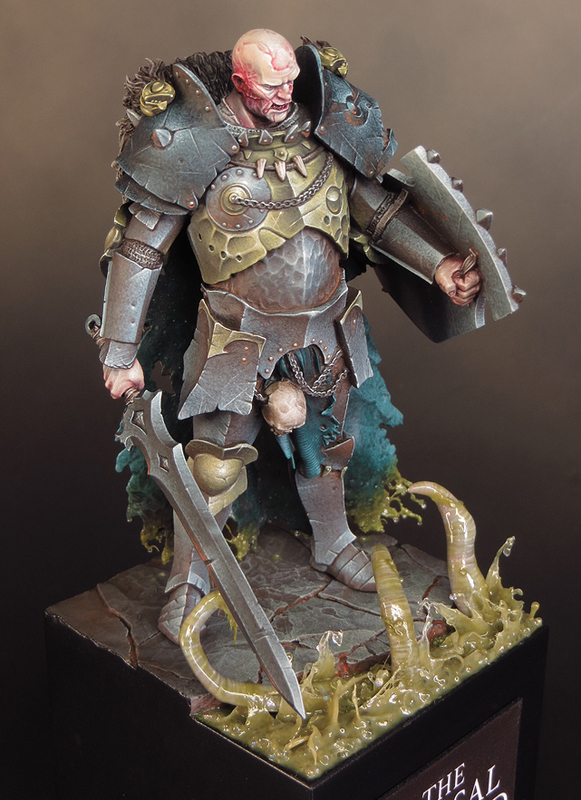 Last summer I painted the Abyssal Warlord from Scale 75 for my workshop at Element Games. Although he started out as a demo mini I decided to try and finish him to competition standard, and I was pretty pleased with how he turned out. 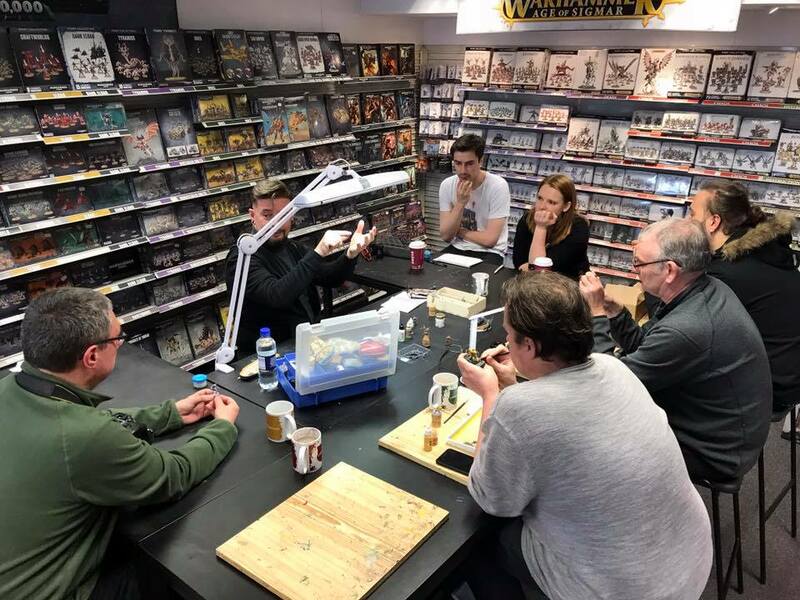 I took the finished model along to the Golden Demon winner’s day, at Games Workshop HQ in Nottingham, to get some feedback from my fellow painters. 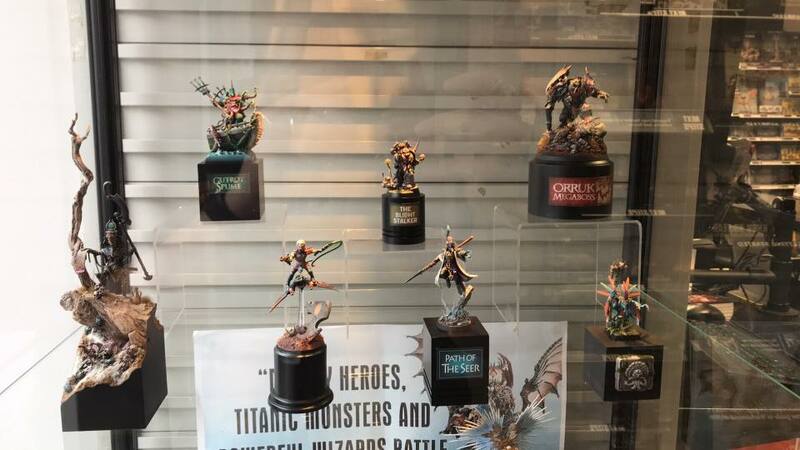 Having successfully smuggled a non-GW model in, without setting off the alarm at the gates, I put him out on display. The reaction was very good but there was one bit of very helpful feedback. Put simply, the rings that attached his cloak to his armour were the weak link in the paint job and didn’t match up to the rest of the model. I believe that we are all our own toughest critics and deep down we always know when something isn’t up to scratch! However, I’m very good at deceiving myself, and it’s all too easy to think that it’s ok and no one will notice. Thank goodness someone did notice and gave me a, much needed, push to sort it out! The root of the problem was in the casting, which wasn’t great in this area. 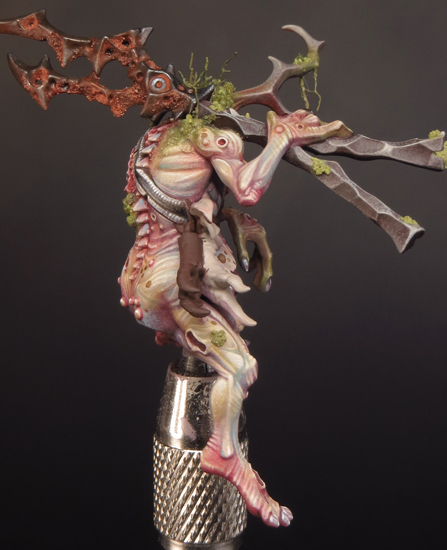 However it’s my job to spot such issues before I’ve glued the parts together and base coated them – my bad! This required a little thought so I put the Warlord in the cabinet and took plenty of time to ponder the issue. I decided the solution was to remove the offending rings and replace them so that I could then repaint the area. It would be straight forward enough to replace them and sculpt some new fur and fixings. Straightforward in principle but bloody fiddly to do! I took a little more time to think through a plan of action and I’m very glad I did. I gradually began to rethink my idea of replacing the rings like for like. This seemed to me to be an opportunity to add something a little extra. 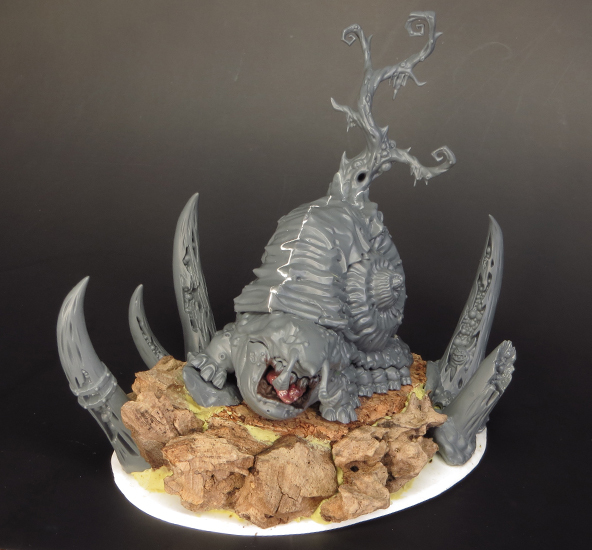 My thoughts came together very slowly but, in the end, I decided to work with the fish theme already on this model and put fish head terminals onto the cloak. 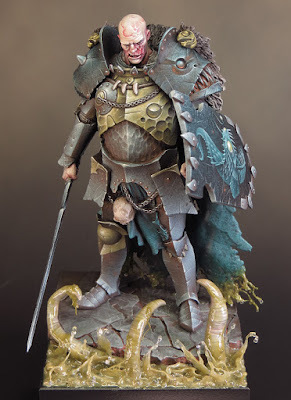 At this point I remembered the fish familiar in the Silver Tower box and I had my solution. The fish familiar was the perfect size and, because it’s made from plastic, easy to cut and carve to fit. With Horticulous Slimux done I decided this week was a good time to get the Warlord out and make the changes to him. The Warlord is a weighty, top-heavy model and this made the whole process much harder than it should have been. To cope with this I had to proceed very (even for me) slowly and carefully. I began by carving away the old rings and a little of the adjoining fur. It was a horrible job but by proceeding with extreme caution I managed to remove the unwanted parts without causing extra damage to the paintwork. Then I had to cut the fish down to size by removing the head, filing off the back half of it’s face and re-carving this surface to fit onto the Warlord’s shoulders. 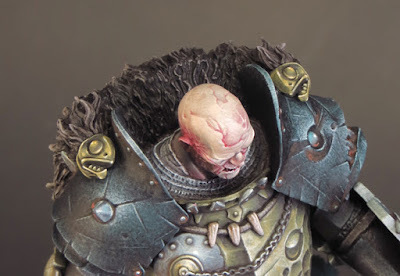 I glued the new, pre-painted, fish head terminals onto the Warlord’s shoulders with epoxy glue and, once this had set, sculpted new fur to connect the old and new parts. 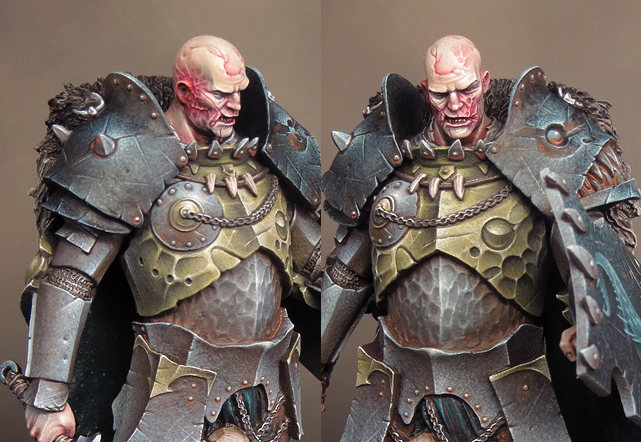 I finished off by repainting the fur to blend the old and new together. 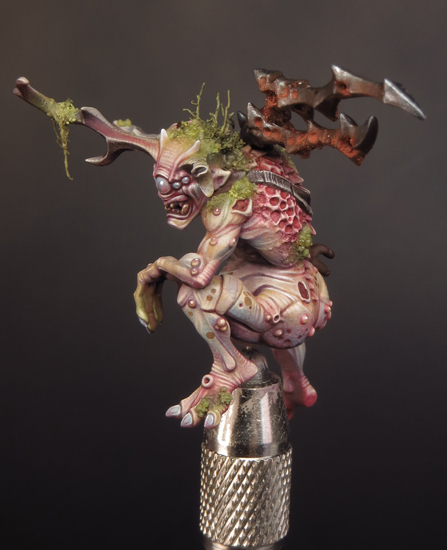 To say the least it was a tricky change to make, and I hate doing this sort of work on a ‘finished’ mini at the best of times! But I think the effort has paid off and I’m very pleased with the result. The new fish head terminals add to the under-sea theme and I think they also improve the overall composition. They help to bring extra focus to the face by framing it with areas of the cold gold. They also create a subtle triangle of gold within the overall colour composition that I find very satisfying! Thanks to Ellis Kaye for giving me the feedback that prompted me to make the changes! 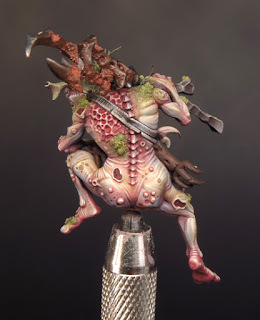 Horticulus Slimux is finished, and it’s been a hard slog because I‘ve pushed myself hard to refine the textures and transitions to the best of my ability! 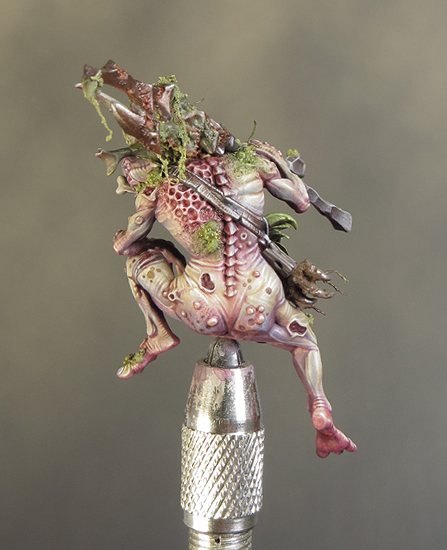 The experience has been quite intense and I found I could only really work on this mini in short bursts, of an hour or two, at a time. But I think the hard work has paid off and I’m very happy with the finished result! The decision to focus my paint job on Slimux’s identity, as an ancient gardener, has helped me to keep an overall focus while working on the many small details. 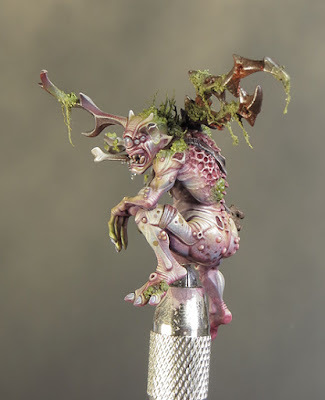 I feel it’s also helped me to create the feeling of Slimux being a distinct individual among the masses of Nurgle’s demons. And that is exactly what I wanted to achieve! 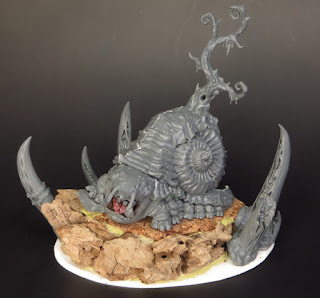 Of course, no matter how happy I am with Slimux, he is just one element of a bigger model and I now have to start thinking about that dirty great snail and the base in more detail! The Saturday before last I spent the day at Warhammer Salisbury as ‘artist in residence’! Recent events in Salisbury had, understandably, made things in town a little quieter than usual. However, you can’t keep a good hobbyist down and I enjoyed a full day of hobby related chat and demos. The morning in particular evolved into an extended Q & A and I hope I was able to share the benefit of my many years of painting experience. 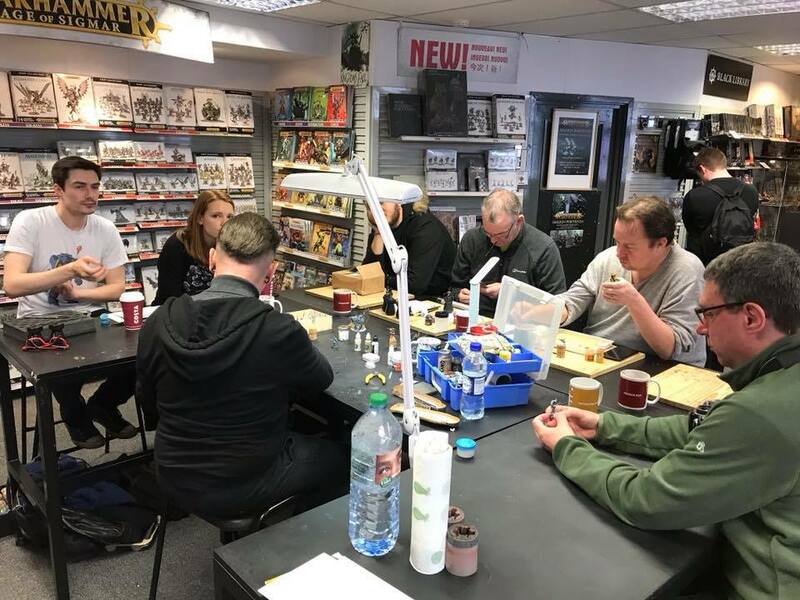 A major talking point of the day was ‘How to take your painting to the next level’. What emerged from these discussions was the conclusion that attention to detail is crucial! This works on many levels but, for the purposes of this article, I’ll try to provide a simplified version. By it’s very nature this hobby is all about detail but there is one VERY important thing to remember. Don’t ever lose track of the overall scheme. Small details, like eyes, fingernails or jewelry, are important but the thing that holds it all together is the overall scheme. Global lighting, contrast, colour and composition are the things that provide a strong foundation for all the small details. Attention to detail means paying attention to ALL the many factors that come into play in creating a successful paint scheme. You can’t cut any corners and ‘good enough’ is never good enough! Deep down I think we all know when we’ve not quite done our best and it’s important to pay attention to, and trust, those instincts. You may well think “that’s easier said than done” and I agree. 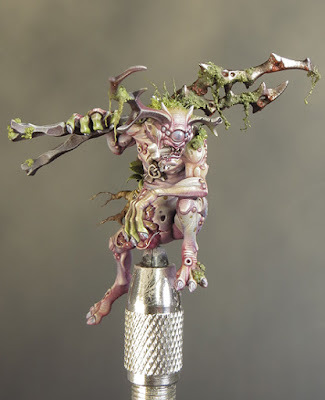 Taking things to the next level, regardless of you current standard of painting, requires you to commit to investing a lot of time and effort. 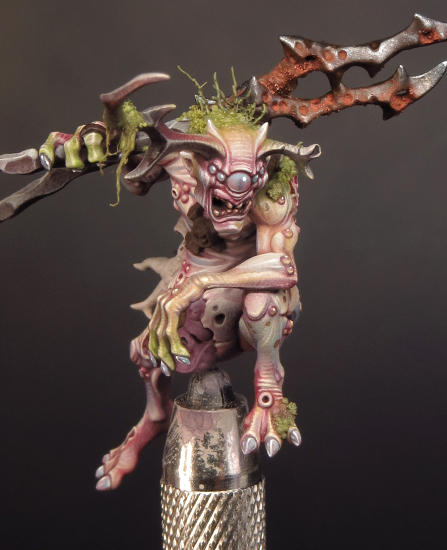 Apart from the odd pimple all of Slimux’s flesh tones are all painted. It’s been worth the effort to achieve the finished effect but it’s been a very hard slog. I’ve had to spend a lot of time going back and forth between the various tones and in a few places the paint was beginning to build up. That’s a problem I’ve not encountered for many years. When paint begins to build up on a mini it can result in a rough grainy surface that detracts from, and spoils, the finished result. It’s the reason I started working with increasingly dilute paint mixes and up until now that has avoided the problem. Avoiding heavy paint build up is by far the best option but if it does occur there are a couple of solutions I fall back on. The first is to burnish the painted surface and flatten out any lumps and bumps. This needs to be done with a clean smooth surface for example the end of a paintbrush handle or, my favourite, the rounded end of a sculpting tool. This all needs to be done with extreme care as it can damage the painted surface and cause bigger problems than those you are trying to fix. However, when it goes well it can work like a dream! My second solution is to apply several layers of varnish to the rough area. Each layer needs to dry thoroughly before the next is applied. Once again great care is needed as it’s all too easy to build up a lumpy surface but that may be less distracting than a rough grainy one! Thankfully a combination of these techniques has fixed Slimux’s flesh and now the surface textures are as I want them! At the same time as I’ve been painting Slimux I’ve been building Mulch. I now have enough of him put together to be able to start work on a base. 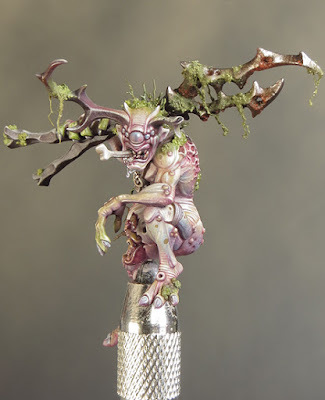 This is something I prefer to do as an integrated part of the project in order that the model and the base work together as an overall composition. It’s early days yet, but I’m pleased with how things are coming together. 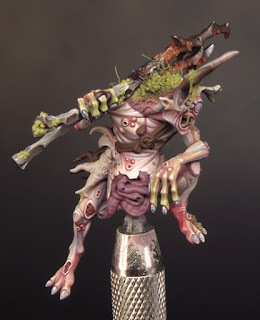 I’ve a good feeling about this project but it’s increasingly clear that it’s going to take a lot of time and effort to complete Horticulous Slimux and Mulch to the standard I expect from myself. As soon as I started this project I began to suspect that it probably wouldn’t be ready in time for the Golden Demon Classic in May and I’m OK with that! I feel that over the last couple of years I’ve begun to fall into the habit of chasing deadlines. A deadline is not in itself a bad thing and I’ve always found that competitions are a great way of giving my painting year some structure and goals. 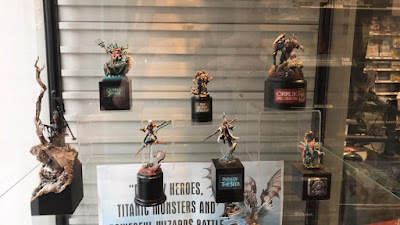 But over the last year I’ve felt increasingly that my painting schedule was getting out of control and competition deadlines are a part of the reason. When I’ve done my best work it’s always been because I’ve taken as long as I needed to do it. It’s time to dig my heels in and reassert my identity as a painter because I refuse to compromise the quality or the experience of my painting. I’m going with the flow and enjoying my painting for it's own sake!